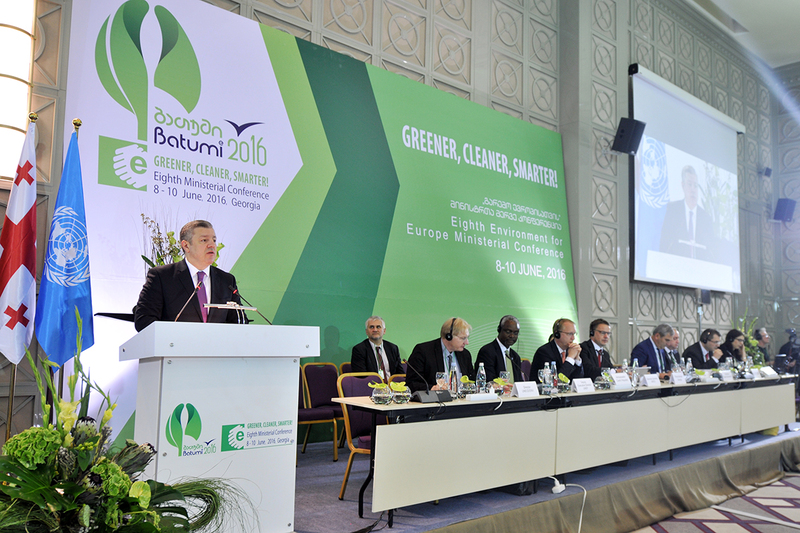 The Eighth Environment for Europe (EfE) Ministerial Conference took place from 8-10 June 2016 in Batumi, Georgia under the theme "Greener, Cleaner, Smarter!". The conference included over 700 participants from 30 countries, many represented at the ministerial level. The EfE process represents an important dialogue for the Pan-European region’s collective effort to promote environmental protection and sustainable development. At the conference, governments endorsed the Pan-European Strategic Framework for Greening the Economy which enables a coordinated approach to a green and inclusive economy across member States of the Pan-European region. It envisions the countries of the pan-European region pursuing a development pattern that ensures economic progress, social equity and the sustainable use of ecosystems and natural resources, so as to meet the needs of the present and future generations. It builds on the policy effort following from the outcomes of the Rio+20 Conference and the 2030 Agenda for Sustainable Development, as well as on the knowledge base and good practices developed in the region. And it is meant to support countries of the region in their efforts to achieve the SDGs and their targets. The Strategic Framework proposes a common vision and three objectives, which are further detailed through nine focus areas. Additional conference documents can be found on the UNECE website. A summary and photo highlights of the Eighth Environment for Europe (EfE) Ministerial Conference are available through IISD. 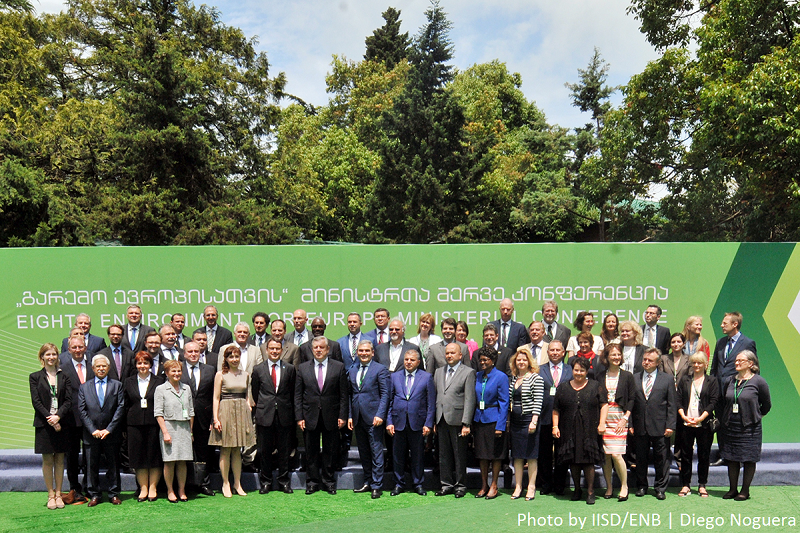 During the EfE Ministerial Conference, Marc Chardonnens, State Secretary for the Environment, Switzerland, launched the Batumi Initiative on Green Economy (BIG-E), which is a set of voluntary commitments by interested countries and organisations to undertake green economy actions. The BIG-E serves to operationalize the Strategic Framework over the period 2016-2030. Taken together, the Strategic Framework and BIG-E provide countries and stakeholders from the pan-European region with a road map to speed up the transition to a green economy. In total, over 30 countries and organisations have submitted more than 100 commitments to the BIG-E and pledges will continue to be made until 2018. 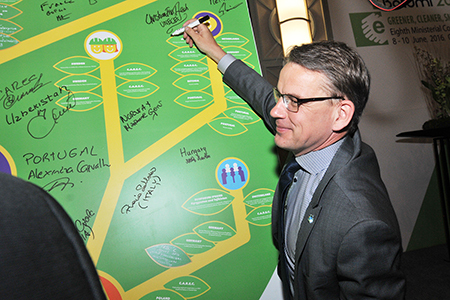 The GGKP is committed to promoting the BIG-E commitments and to updating and communicating efforts towards implementation of these commitments. The GGKP’s role in this effort was acknowledged in the Chair’s Summary. To access the BIG-E database, where you can filter through the various commitments made by countries and organisations, click on the link below. Below are direct links to relevant country pages and the BIG-E commitments made by countries and organisations to date. This list is continually updated as additional commitments are made.